These substellar objects were first conceived of in the early 1960s as "failed stars". Stellar models suggested that a true star must have a mass at least 80 times that of Jupiter to kindle the stable fusion of hydrogen (this limit is currently thought to be about 75 jupiters). Objects with less mass were believed to exist, but it was recognized that they would be extremely difficult to find because they would be quite low in luminosity, and emit very little visible light. For that reason, they can be viewed as a constituent of baryonic "dark matter". Indeed, we currently have a hard time directly seeing an old brown dwarf beyond 100 pc. After 20 years of searching and false starts, the first confirmed brown dwarfs were announced in 1995. This was due to a combination of increased sensitivity, better search strategies, and new means of distinguishing substellar from stellar objects. Since then, a great deal of progress has been made on the observational front. We are now in a position to say a substantial amount about actual brown dwarfs. We have a rough idea of how many of them occur as solitary objects and how many are found in binary systems. We have obtained the first glimpse of atmospheres intermediate in temperature between stars and planets, in which dust formation is a crucial process. This has led to the proposal of the first new spectral classes in several decades, and the need for new diagnostics for classification and setting the temperature scale. The first hints on the substellar mass function are in hand, although current masses depend on models. It appears that numerically, brown dwarfs may be nearly as common as stars (though they do not contain a dynamically interesting amount of mass). Caption: Artist's Impression of the brown dwarf Gl 229B (with the low mass star Gl 229A) sitting about 40 AU away. 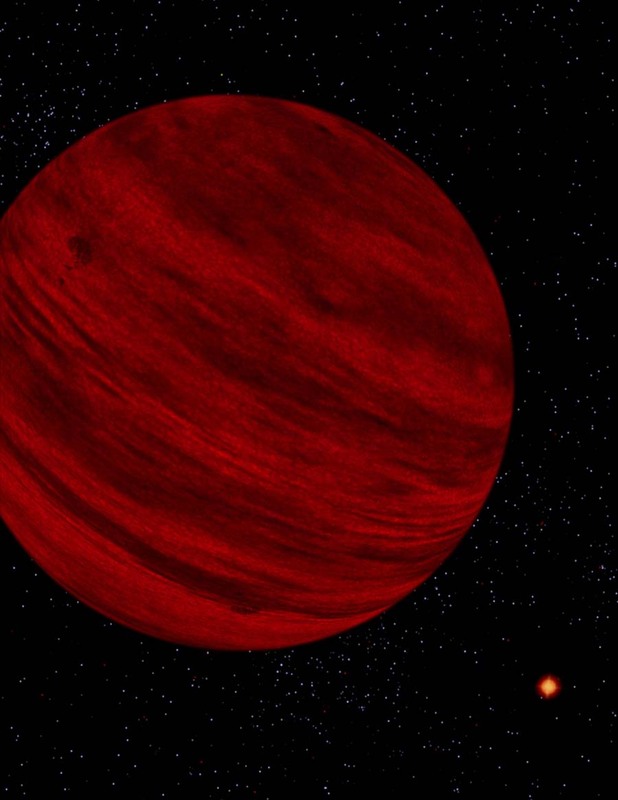 This brown dwarf is a few billion years old, with a surface temperature of about 1000K. Its mass is in the 30-50 jupiter mass range (or 3-5% of our Sun). The dull red color is what your eye would see, there is more luminosity coming out in the near infrared. The dark bands are hypothetical; although dust does form in the atmospheres of brown dwarfs, it is unclear how non-uniform their appearance is. The banding is reasonable, since they usually rotate very fast (in hours; like Jupiter). A couple of magnetic "spots" are also shown; there is evidence of magnetic fields at least on the younger brown dwarfs (although it doesn't give rise to the same atmospheric heating and activity as on stars). Gl 229B is about 100,000 times fainter than our Sun (and almost 1000 times fainter than its low mass stellar companion). "The Discovery of the First Lithium Brown Dwarf: PPl 15"
"50 Years of Brown Dwarfs"
The final verison (pdf) of "Observations of Brown Dwarfs"
"The Discovery of Brown Dwarfs"
"Brown Dwarfs: Up Close and Physical"
Last updated on Jan. 26, 2004. I would like to acknowledge the support of the National Science Foundation through grant AST-9618439 for much of my work that is reported on this page. Eduardo Martin has been a full collaborator in most of it.